You know what it is like to start, say, jogging. The first thing you do is not run. No, no, no. Instead you drive to a fancy sporting goods store (with valet parking), feeling all good about yourself and your new-found enthusiasm towards keeping fit – and purchase running shoes. You know, the latest model with ergonomic aircushions and LED infrared lights and the same microfibers they used in building the International Space Station, hand-picked for you by an athletic-looking personal trainer/sales associate/part-time waitress. And accessories. You buy accessories. In 1980s a sweatband, in 2010s a pedometer with GPS satellite tracking and voice-activated thingamajig – and iTunes. You are feeling so pumped about this, that you actually report the store visit as a sporting activity in HeiaHeia or something, coupled with Facebook and Twitter integration of course. Now all your friends and followers know you are an avid jogger. Then, and only then, do you start planning on doing some actual running. Which you won’t ever do. The great thing about LEGO is that you can take them apart and continue to build new things even after the initial model is completed. And LEGO bricks are very durable, so you can keep on doing this pretty much indefinitely. Thus, it is no wonder these toys have such longevity, not just for children, but for all those adults as well who go AFOL and pick up where they left off as a child. Because the bricks are so well made and create such durable structures, sometimes they can be a bit hard to pull apart, though, especially the small ones. And since they are still just plastic, using power tools and/or your teeth for demolition does leave marks. Do this a lot and they will leave a lot of marks. 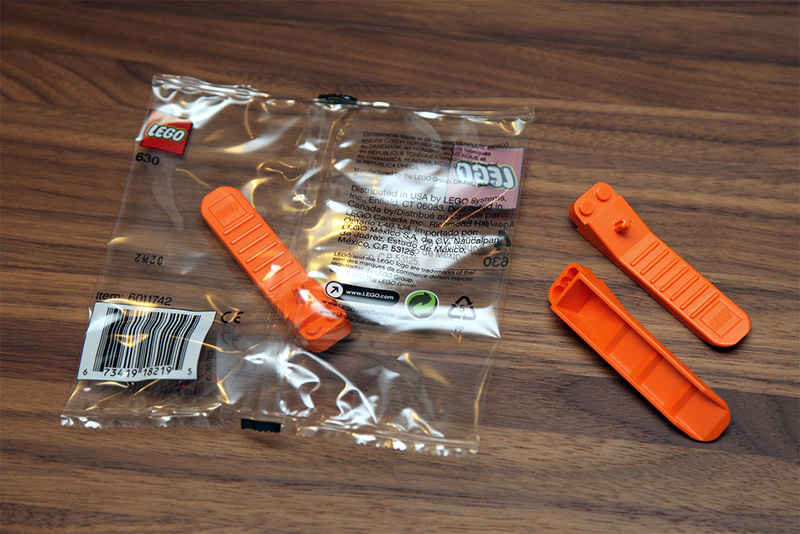 So, to avoid more of this in the future, I went ahead and ordered from LEGO a 630 Brick Separator. My first tool for building LEGO, ever. Actually I ordered more than one, for my son and a spare too. Remember, I am still mentally in that sporting goods store. So what is this very orange 630 Brick Separator like? Well, first of all, it is a lot smaller than I thought. Last week when ordering LEGO still had the picture of the old grey version in the online store (apparently there was a green separator before that, which looked like the grey version), with a small mention of different color, but turns out the new version is also a little different in shape and function. The whole tool is thinner and just “two wide”, instead of widening towards the end of the handle. There is also an additional stub for pushing out LEGO Technic axles. The axle-pusher seems like a nice bonus, although axles were always much less of a problem since you could use any other axle for the removal job. The stub is also quite short and the handle which it sits on angled, so I expect the axle-pusher to have trouble with pushing things out of large walls because the handle will get in the way of inserting the stub (unless you separate the pieces first). 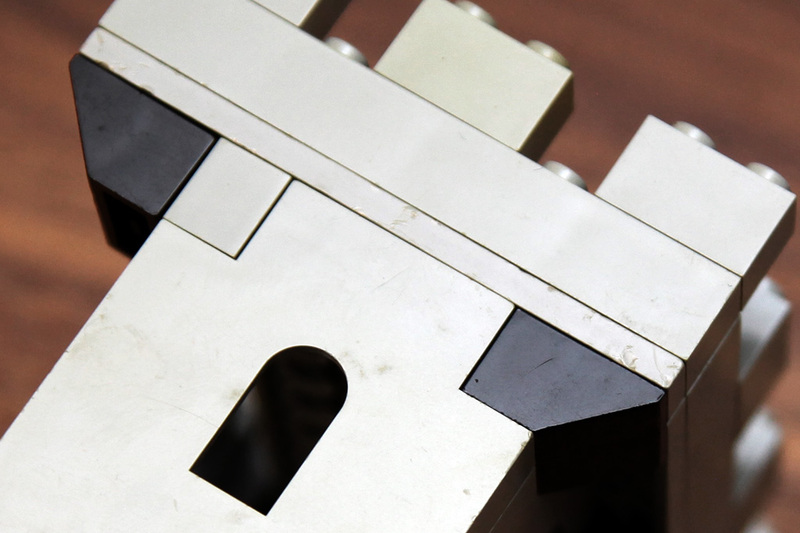 The main function of the 630 Brick Separator is, of course, separating LEGO bricks (especially thin bars) and plates from each other. You can do this both for bricks above and below the handle. First you connect the tool to the brick to be removed, using either the top or the the bottom of the 1×2 head in the separator. Then you twist up or down, depending on which side you are using, and the piece comes off. It really does work. The handle is angled quite a bit, so there is room to twist even when removing thin plates from larger plates. 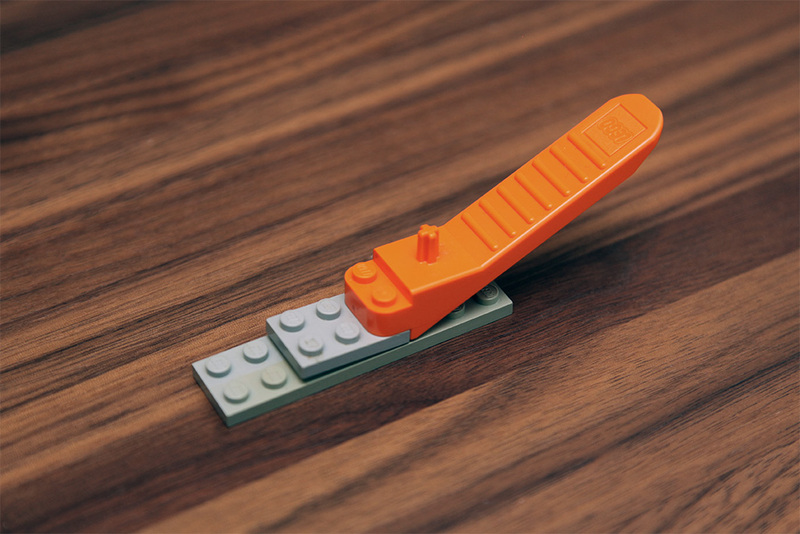 My spare 630 Brick Separator came in handy immediately since separating two thin bricks from each other requires two tools – one connects to the bottom brick and the other to the top brick from opposing sides and then you twist. Now, the only problem remains removing the brick from the separator if the piece too is just a 1×2 – luckily the corners of the tool are rounded, so you can just push the brick out from a corner. No more broken fingernails or toothmarks! Great stuff. I do expect some users of the older grey or green versions to find the handle in this orange edition a tad bit small, though. Next: Actual bricks. Don’t worry, this castle project won’t turn out like jogging. Promise.